I grew up on Newfoundland pea soup. My grandmother always made it, typically with ‘doughboys’ (which are flour based dumplings plopped right in the pot on top of the soup; they cook up nice and fluffy). I don’t serve my pea soup with doughboys (though I enjoy them). I’d much rather save the belly room for another bowl of soup. You gotta weigh your foodie options, am I right?? Years ago, I’m talking about 20 years, when I wasn’t as ‘kitchen-experienced’ as I am now, I decided to make pea soup on the stove top. After all, I grew up with the stuff, right? What?! Cause, ya know, the most sensible thing to do is turn on the stove to make soup and leave it. Yeah, not good to say the least. These days I’d like to think I’m a little more sensible, but only by a tad, lol. My cooking skills have improved considerably since then. However, there are things I’d still prefer to be blissfully unaware of, ya know, like calories in a glass of wine or in a brownie….hehehe. Nowadays, I make my split pea soup in the slow cooker. And, guess what? I can leave it!! Ha! Guys, when I tell you this split pea soup is easy, I’m not lying (not that I’d ever do that to you, anyway, but you know what I mean). You literally place all the ingredients in a slow cooker, turn on low and that’s it. Dump and go. 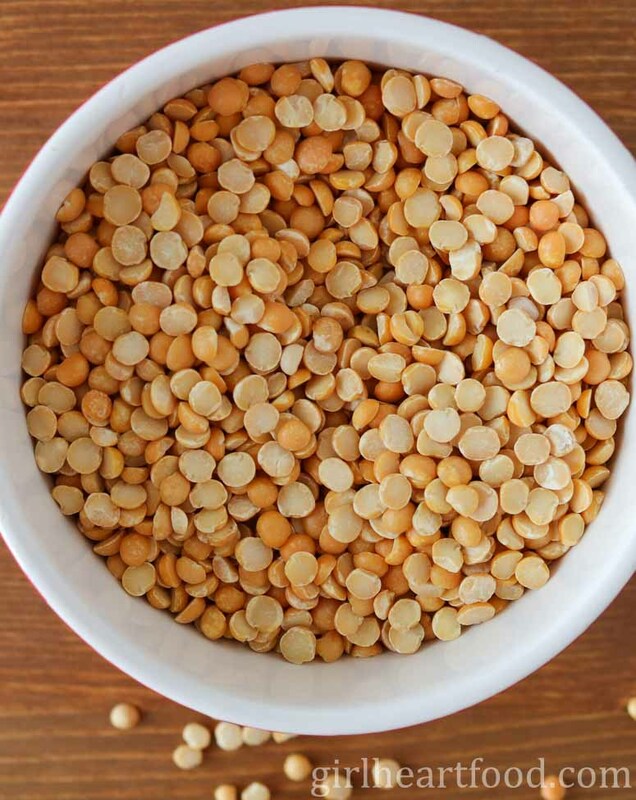 Do I need to Soak Split Peas for Slow Cooker Split Pea Soup? Nope! Just make sure before you use them to rinse and remove any rocks (yes, there could be some in the bag) or dark, inedible peas. Other than that, they just go in the slow cooker with the other ingredients. 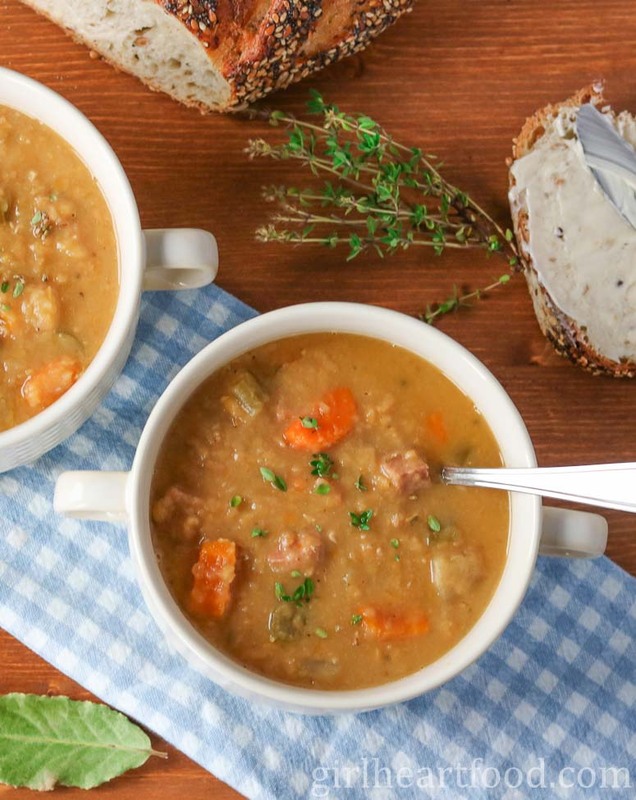 Does Split Pea Soup Thicken As It Cools? It sure does! This split pea soup thickens up considerably as it cools. If you are re-heating on the stove top, you can enjoy as is or add a little more chicken stock to thin out. Can Pea Soup be Frozen? How to Freeze Pea Soup? Yep! It freezes beautifully! Once cooled, you can portion up into vacuum seal bags, press flat (so you have a ‘sheet’ of soup in a bag) and freeze to enjoy at a later time. If you don’t have a vacuum sealer, place into regular freezer safe bags or tubs. Thaw when ready to enjoy. Great for busy weeknights! Every model of slow cooker is different. I have a super basic one. It was actually a wedding gift and I treasure it. For me, I cooked this split pea soup with ham on low for 7 hours and it worked out wonderfully. If you need an extra hour or two, no biggie. Also, don’t open up the lid if you don’t need to because it will increase cooking time. Don’t throw away those celery leaves! Chop ’em up and throw in the pot. They have so much flavour! Turnip (rutabaga) is pretty popular in Newfoundland split pea soup too. I didn’t use it here, but feel free to add some or sub out the parsnip. Being a huge vinegar fan, when I pour myself a bowl of this stick-to-ya-ribs split pea soup, I always, always, enjoy a splash of white vinegar. And you can also garnish with additional thyme, if you’re feeling fancy. Trust me, it works. 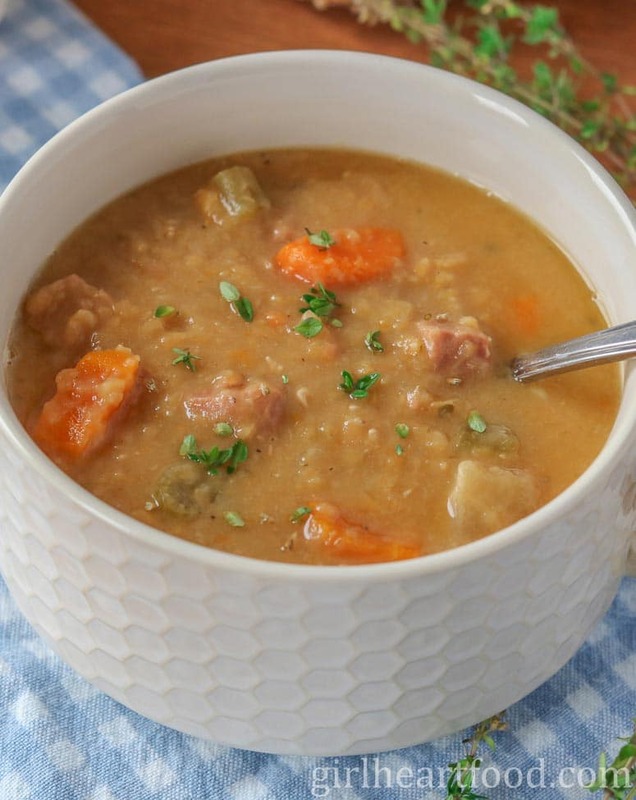 Hope you love this slow cooker split pea soup – it’s reeeeally good! I love anything I can set and forget and this soup sounds amazing!! So do those little doughboys. Do you have a recipe posted for those? If not, you should! Me too! I definitely should 😉 Thanks Terri! Pea soup is my all time favourite soup. I have never tried to make it in a slow cooker and now I want to! Thanks so much for the great idea, Dawn. YES! I love any slower cooker recipe. It makes making dinner so easy! This recipe looks cozy and perfect for these cold days ahead! This is just the kind of thing I’m craving right now with the weather getting chilly – a big bowl of comforting deliciousness!! I hear ya on early cooking woes! I can’t tell you how many times I set off the fire alarm when trying to broil bread (or broil anything!) without forgetting about it when I first starting cooking! Oh, bread! Yes, I’ve certainly burned my fair share of toast, lol. Thank you Marissa! We all need lots of soup when the cold weather hits, don’t we 😉 ? It is like a big hug, isn’t it?!! Now I have to figure this out. I thought split peas were only green. And anything else was a lentil. Obviously I’m wrong! Cant wait to try your recipe! Nothing like comfort food, is it?? Hope you get a chance to try soon 🙂 Thanks so much, Ben! 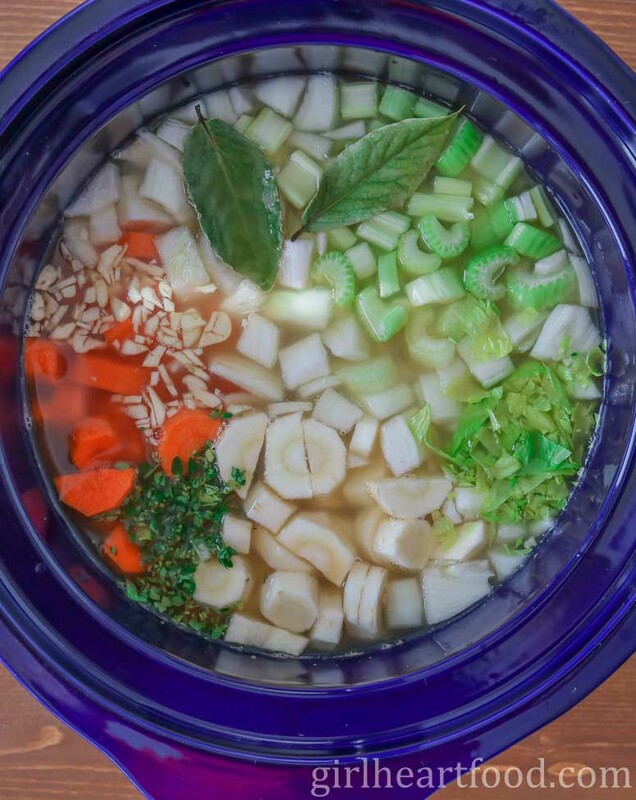 Such a great idea to use the slow cooker for this soup, gives the flavors time to simmer together! Pea soup totally takes me back to my childhood! And doughboys were always a must! I’ve only made it a few times myself but it’s always been on the stove top, never the slow cooker. I need to try that. And I have a ham bone in the freezer from Thanksgiving so I should pop that in there! The splash of vinegar on top sounds like a good idea too! Hope you’re having a great week Dawn! Enjoyed this so many times growing up! Love that vinegar 😉 Thanks Leanne – have a great week too! I love split-pea soup, Dawn! But I’ve never made it! I love a toss and go recipe, too! Thanks so much for this recipe! Pinning! Split pea soup will always remind me of my mom Dawn! She made it all the time during the fall and winter when we were growing it! This looks delicious and I love that it’s a slow cooker recipe! Pinned! Lol!! Too funny! Sometimes scrubbing salt on burnt pans works….speaking from experience, lol. Good thing for slow cookers 😉 Thanks David – have a great week. You had me at a hug from Grandma! Dawn, this soup looks so warm and cozy. I thought turning on the stove and walking away from it was my trick! This looks SO GOOD! And I’ve been thinking about it since I saw it on Insta this morning :). It’s getting chilly (sort of) here so I’m definitely in comfort food mode. I love that you garnish (if that’s the right word) your soup with vinegar–that’s a new one for me but it sounds awesome. Have a great week, Dawn! Thanks a million, Kelsie 🙂 Yes! 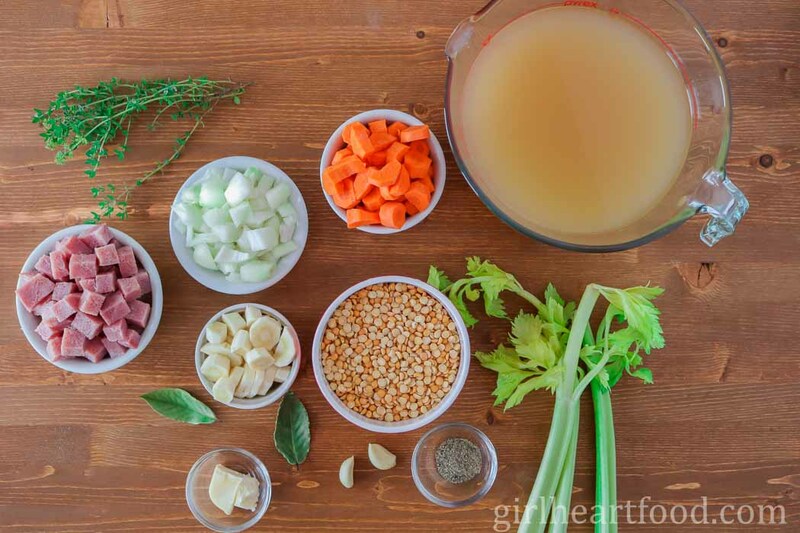 Love vinegar on most things, but it really works well in this soup. Have a great week too, Kelsie! I’ve been known to forget a pot or two on the stove! The slow cooker is wonderful for so many reasons and being able to leave it unattended is just one of them! 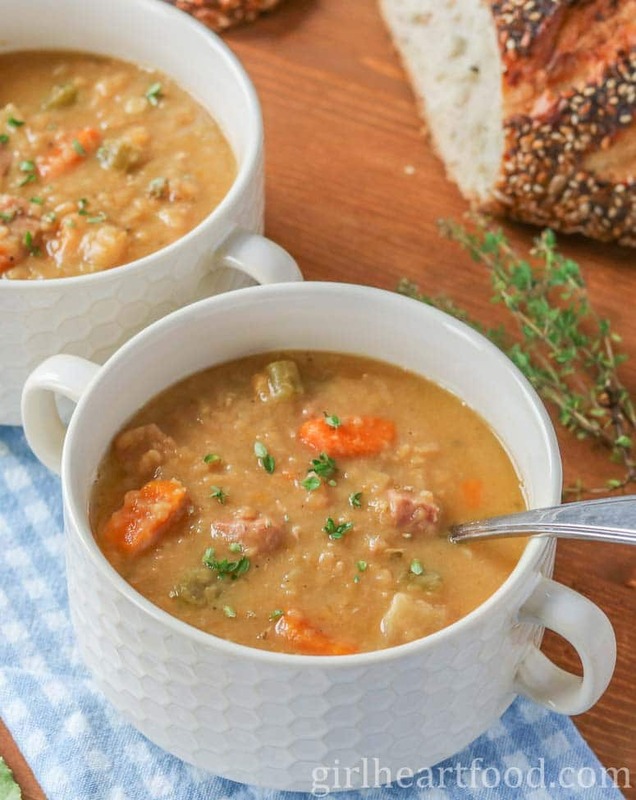 This split pea soup is perfect for these cold days. Nice and hearty and delicious! Glad to hear I’m not the only one 😉 Thanks so much Kathy – gotta love the slow cooker!